Abandoned as a young child, Kalu, a cheeky street kid, has carved out a life for himself in rural India. In the quiet village of Hastinapore, Kalu has also found friends: Bal, the solitary boy who tends the local buffaloes, and Malti, a gentle servant girl, who with her mistress, Ganga Ba, has watched over Kalu since he first wandered into the small town. One day, perched high in the branches of a banyan tree, Kalu chooses a leaf, rolls it tightly, and as he’s done for as long as he can remember, blows through it. 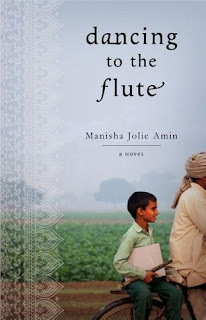 His pure, simple notes dance through the air and attract a traveling healer, whose interest will change Kalu’s life forever, setting him on a path he would never have dreamt possible and testing his belief in himself and his sense of identity. Take a trip through rural India. Learn about it culture and especially its classical music. Meet Kalu, a young boy who lives on the streets. To survive he runs errands. It was hard to imagine that there could be anyone worse off than he was. Kalu has a friend named Bal. I was sickened to learn his family sold him. He had even less than Kalu had. Kalu had a talent that helped him improve his life. He was gifted at playing the flute. This ability gets him noticed. It also is what helps him get an education. As he travels we are shown the sights and sounds of life in rural India. The descriptions are so vivid you get the image in your head and it stays with you. Just because he is discovered doesn’t mean trust comes easily to him. Hope is something he tries to hang onto, but it is difficult when there has been so much pain in a small life. A great book from many aspects, learning about India and its classical music, learning about the lives of those who are on the lost rung of the caste system. I’ve heard stories from some of my Indian students, but this book brought it so much clearer. A great book to read and learn from. I recommend you read the book to see just how his life was changed and who it was that helped bring about that change.